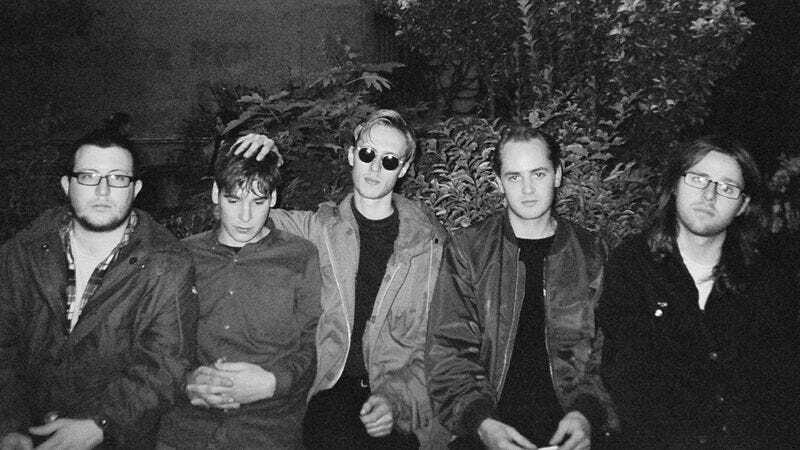 The members of Leeds, England, punk band Eagulls have never been shy about speaking their minds. In fact, one of their most notorious outbursts was a hand-written letter lambasting the band and promoter stereotypes permeating today’s music scene—from the trust-funders and the trend-jumpers to the poseurs and the fakers. But like the rabble-rousers they are, Eagulls are infiltrating the system that lets these shenanigans flourish: Thanks to their 2013 SXSW performances, the group nabbed a record deal with the U.S.-based Partisan Records, which recently released the group’s excellent self-titled debut LP. While trying to find a quiet spot to have a conversation—which proved to be a daunting task—Goldsworthy discussed indifferent sound engineers, how they learned to avoid the biggest drunk warzones, and what SXSW has done for them. The A.V. Club: You guys have played eight shows so far? Mark Goldsworthy: It could even be more, I’m not even sure. We just played one an hour or so ago, so maybe that was the ninth. I’ve lost count. AVC: How are you holding up? MG: I’m not doing bad. The first couple were hard to get into, getting used to playing earlier in the day. But we’ve got a bit of a routine now. You can’t play three shows a day and give everything in every show. It feels like you’ve got to hold something back for the next show. That’s the mentality I go into it with anyway—but once onstage, it’s hard to stop yourself from getting into it. AVC: What’s been the best show you guys have played so far? MG: I’m not sure. The one we just played this afternoon, I enjoyed because that the sound guys were really on it. And when the sound’s good, I get into it more. The show we played last night, I really enjoyed. We were all really tired and had it in our heads that maybe we weren’t going to play that great on the night, but we all managed to come back down an hour before the show and I really enjoyed that one. AVC: How has your experience been with venues? Any horror stories? MG: Oh yeah, definitely. I have had some nightmares, but you got to take it all with a pinch of salt. I was playing a gig last year here at South By Southwest, and the band that was on before us had the monitors really, really high up. The monitors were just howling feedback at me. I turned right to look at the monitor guy at the side of the stage, [to] tell him, “Switch this monitor off.” And he was still playing his Game Boy with his headphones plugged in, so he could hear the sound of the Game Boy. I was so angry, but it was so funny I couldn’t shout at him or anything. AVC: It’s really comforting the sound guy cared so much about you guys. MG: Yeah, I mean—they are getting paid. But they’ve probably never heard your band before and will never listen to you again, so it’s not a big deal. You do get some that are really nice and accommodating and helpful and stuff like that. AVC: You guys got a record deal out of SXSW last year. Has anything been brewing this year? MG: I’m not sure, really. We’ve heard people talking about different stuff. I take all that with a pinch of salt until it actually happens or you’re signing a contract or a gig’s getting booked. It’s more just opening more doors for us in America, like coming here to play festivals and stuff like that. AVC: Last year you received a grant to get to SXSW [a British Music Abroad grant from the PRS For Music Foundation]. Did you get that again? MG: You can’t really apply and get it a second year, but it’s all judged on your needs as well. Of the gigs we’ve played this week, some of them were well paid, so it just about covered all the costs. We didn’t need [the grant] this year. But it is a really good thing for bands that—artistically and stuff, there’s an audience for them, but financially there’s not an audience for them to come here, if you know what I mean. AVC: How much did you guys spend getting to SXSW? MG: We won’t be going home with any sort of cash—we just covered our flights, because it’s very expensive to get here and stuff. I don’t know the exact figure, I don’t know exactly how the flights [priced] out—just five people’s flights from England and back. AVC: That’s not bad—it could be a lot worse. There are horror stories about people going into debt thousands of dollars. MG: Definitely. Yeah, that’s crazy. If you manage to get a grant in England, that’s really something. They’re not really that unobtainable if you’re organized about it and professional about it. There are a few hoops you’ve got to jump through, but I think they’re quite fair. They give everyone a fair chance, no matter what kind of music you’re playing. The opportunity is there. If you’re coming from England, if you haven’t got decent-paying shows booked out here or the possibility of even getting [funding], you shouldn’t really do it. Last time, we put some money in ourselves, but I think… People come here expecting a big payout and think they’re going to get signed and everything, and I think they put all their eggs in one basket. I think it’s foolish to put all your money into one week. AVC: Did you do anything differently this year that made your experience better? MG: [Last year] it was all of our first times in Texas. We went to Sixth Street on the first night. I found it disgusting. It was horrible. We were all really depressed, like, “Is this it?” It’s just like going out in England on a Saturday night in some crappy town. We were all really down about it, and it took us a couple of days to find nicer places, and we started enjoying it a lot more. We know the places to avoid now. I hate walking down Sixth Street at the night. It’s full of idiots. I don’t find it very comfortable. All the nice places are further out. I think we learned places we like going. AVC: A few years ago SXSW coincided with St. Patrick’s Day, and it was awful. The drunk college kids on Sixth Street who didn’t care about music at all, it was like the apocalypse. AVC: It’s like when you watch 28 Days Later or something, and there are zombies coming down the street. We played a gig on Sixth Street at 3 in the afternoon that was quite nice. We had [another] at one at night at Buffalo Billiards, and by the time we finished playing and came out, it was two o’clock. There were people just fighting in the street. You don’t feel safe walking around with your instruments, you feel like someone’s going to try to grab your stuff. It feels like something could erupt at any minute.